There is still plenty of snow on the ground and we are expecting 6-10 inches (15-25 cm) to fall starting late tonight through Wednesday morning. But this last week has seen temperatures a few degrees above freezing, lots of sunshine, and a little bit of snow and ice melt. By the end of this week, in spite of the snowstorm, we might get as warm as 40F (4.5C). That probably doesn’t sound warm to some of you but to us in Minneapolis it means winter is packing up and getting ready to leave. There has also been a subtle change in the air. I don’t know what it is, but there is a shift that has happened that says spring is on the way. This same shift happens at the end of August too. One day I wake up and walk outside and it just feels different and I know fall is on the way and the leaves will begin to change soon. I love being able to feel the seasons change. I received some of the seeds I ordered in the mail already. The prairie seeds from Prairie Moon Nursery. Coneflowers grow really well in my garden so I thought I would embrace them and widen the variety. I got pale purple coneflower (echinacea pallida), Tennessee coneflower (echinacea tennesseensis), and Bush’s coneflower (echinacea paradoxa). I also got some grass seed, prairie dropseed (sporobpus heterolepis). It is a bunch grass native to short grass mesic prairie. It will add some interest to the little bluestem grass I already have. And they sent a free pack of showy milkweed (asclepias speciosa) seeds. Yes, that’s right, a four-tier greenhouse. Well, really it amounts to four shelves with a plastic cover that zips over it, but put this baby out on a sunny corner of the deck and it is perfect for starting seeds in before the ground thaws. Saves us the trouble of grow lights and hardening off and all that. It’s not the greenhouse of my dreams, that would require a many-acred estate, but beggars can’t be choosers. So to get my garden fix, I pulled some books off the shelf. Carrots Love Tomatoes is a useful little book about companion planting. It includes common garden vegetables, herbs, fruits and trees and plants that are beneficial to plant with them and plants that should not be planted together. It goes beyond the generally well known triad of planting corn, pole beans and pumpkin together. I have never done that actually because I’ve never grown corn in my garden. This year though, I’m gonna try it. Along with its usefulness, it is also rather humorous. It was originally published in 1975 and has a recipe for getting rid of freckles. 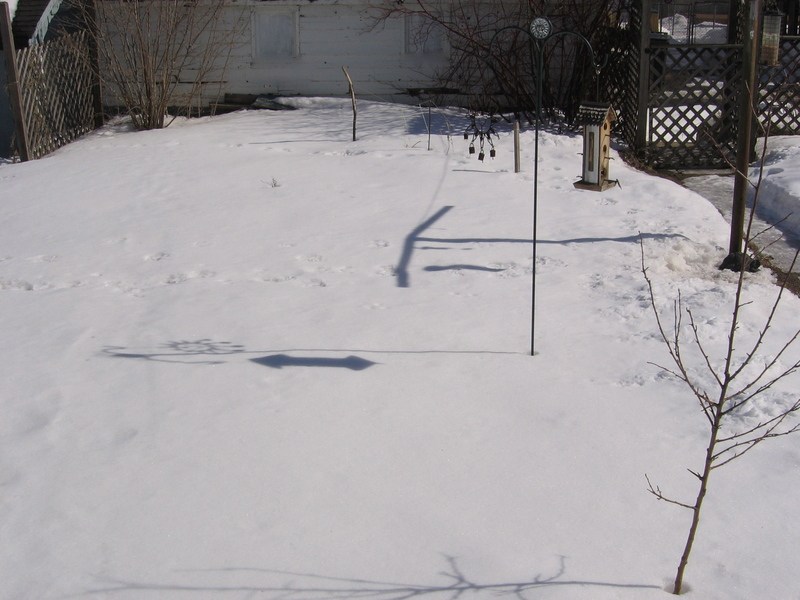 I also pulled Month-by-Month Gardening in Minnesota off the shelf. This is a very useful book and I am glad I looked through it because I found out I can plant my cool weather veggies two weeks earlier than I thought I could. I am also going to try doing some succession planting this year, something else I have never done before and the book is good enough to tell me, given my first frost date, how late in the season I can plant things. So hopefully I will have two crops of beets, radishes and a few other things. And because I was in a gardening fever I took Between Gardens: Observations on Gardening, Friendship, and Disability by Carol Graham Chudley and Dorothy Field off my TBR shelf. The wonderful Sylvia sent this to me, we won’t say how long ago, but the book’s time has finally arrived. And besides being about gardening, it is also letters. The disability referenced in the title is chronic fatigue syndrome. It is a beautiful book with the letters between the friends, pieces of Carol Graham Chudley’s diary (she had CFS and died in a tragic accident as the book was close to completion), and garden photos taken by Dorothy Field. I’ve read about forty pages and I am loving the book. Even though I can’t get out in the garden yet, it’s been a good gardening week and an excellent gardening weekend. Now I feel lucky to live in Virginia and still be pulling fresh Swiss Chard out of my garden. Still looking forward more variety come spring. Thanks. severalfourmany, you are lucky indeed! I’m glad to hear that you can sense that Spring is almost here. We’ve had unseasonably warm temps, even for us in California. They say we will have a very wet March. I think it means more time inside and more reading time for me! boarding, I’ve heard about your warm temps. When I was in San Diego in January visiting family it was 80! Sounds like if it is a wet March for you that you are well prepared! I’m glad that there are signs of spring in Minnesota- your winters are so much harsher than ours that there is no comparison. In UK back in November/December there were some hairy headlines that we were in for the worst winters in over 100 years! Didn’t happen and it has been a fairly benign season. Looks like we are in for rain later this week though. Ian, I am glad you didn’t have the worst winter in 100 years! Winter this year has been a little warmer than average but much closer to “normal” than lat year’s winter. Still, we are the fastest warming state in the US when measuring for climate change so it is hard to know what normal is anymore. I no longer have a garden, but I still love reading about them. I’d rather get my hands dirty, but Elizabeth Lawrence, Henry Mitchell, Allen Lacy, and others fill my thirst for a garden and my pleasure in excellent writing. If you can find it or borrow it, Lawrence’s Gardening for Love is a charming slice of American history, when farm women earned pocket money selling seeds and plants from their gardens through market bulletins. After 35 years in New England, I swore I’d never shovel a sidewalk / drive / patio again. I don’t envy you your winters and, as much as I miss Boston, I don’t miss those winters either! Joan, thanks for the gardening book recommendation! My public library has a copy so I have put it on my list. I actually enjoy snow shoveling. I am weird that way. But even I get tired of it this late in the season. Enough already! Still, it makes me really appreciate spring and summer even more. My neighbours have a four tier greenhouse and it works wonders for them. In fact, they just invested in second one, so it must be doing something right. And I do know what you mean about that change in the light. It always makes me think of a line from an Emily Dickinson poem, ‘There’s a certain slant of light’. Alex, so glad to hear your neighbors have one and how well it works. I don’t know anyone who has one so it felt like taking a leap. Emily Dickinson knows her stuff doesn’t she? There is definitely a certain slant of light and I always get a shiver of pleasure when I first recognize it. Your garden posts always inspire me! I always have big plans and then never quite get to it all, but I suppose that’s normal. This year I might try some more native flowers, and I need to fill in a lot of bare dirt. I’m thinking of spreading pretty alyssum seeds around since that seems to do quite well here and re-seeds itself. It is also completely bizarre to me that you need to actually buy seeds and plant morning glories, which is a weed back home in Oregon. It’s so fun to learn about plants. I think I can probably start planting some hardy things pretty soon, lettuces and kale and such. Next month is tomato time! Hard to believe. wherethereisjoy, you make mutually inspiring garden posts 🙂 I always have big plans too, but this year I’m not going to balk at all the hard work when the days start getting hot and humid. I will be out in the garden at 5 a.m. on a Saturday morning if I have to. I do like alyssum. I have a packet from last year I didn’t plant that I am planning on putting in the front of a bed of sunflowers and zinnias. We usually save the morning glory seeds from year-to-year but last year we had a crop failure and had no seeds to save. Sometimes they will reseed themselves but not reliably. I can’t safely put out tomatoes until mid-May! I’m afraid I am an armchair gardener, too, though I like looking at them and visiting them (and reading about them). I just have no luck with the plants and flwoers I have tried to grow in the past–so I will live vicariously through you! 🙂 Sorry to hear about the snow–we might get just a dusting tonight/tomorrow, which I am not sad about. The only good thing about snow this late in the season is that it won’t last long on the ground. I am so looking forward to sunnier, milder days and longer daylight as well. I have yet to feel that turn of the season, but I hope it comes soon! Danielle, armchair gardening is completely valid. I was an avid armchair gardener in the years between leaving home for college and having my own house. When I was growing up my dad was a great veggie gardener and I learned a lot from him. My parents also let me have a little plot to grow whatever I wanted, usually flowers. My own garden has been lots of trial and error. We got about 5 inches of snow overnight and will get another 4 or so through the day today. We haven’t gotten warm enough yet to count on all of this melting any time soon. We’ve had snow on the ground continually since early December. I suspect we won’t see much bare ground until the end of the month. I’m glad you’re enjoying the book. 🙂 For every book there is a season! We are finally seeing crocuses and the tips of the daffodils! Spring is late here this year, and I am longing for it to arrive. Love your mini greenhouse. I am so tempted to get one but I’m not sure where I’d put it. You must let me know if it works well! Litlove, oh, lucky you! I won’t be seeing any of those for another month to a month and a half. 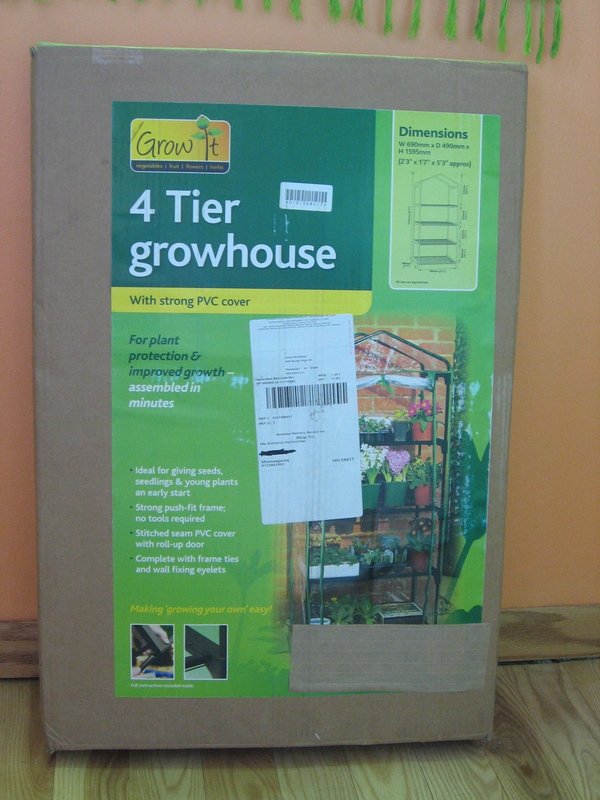 The mini greenhouse being mini means it is mobile and easy to store in winter. I will let you know how it works. I have high hopes for it! Danielle, Oh I hope you had a nice day off! And how convenient you didn’t have to deal with the new snow! Long range forecast says chance of snow several days next week. March is usually snowy here but while we can and have gotten snow in April and May, by the end of March our snow chances diminish greatly. It’s just holding on until then that is the hard part!